NATIVE TONGUES – A Musical Pow! Wow! | Allied Productions, Inc.
F / V trains to Second Ave. Walk east on Houston St. or J / M trains to Delancey. Walk northeast to Houston St.Rain or Shine. FREE or voluntary donation. September 30 Saturday 7 PM. NYC stalwarts, legends and rising starts present an evening of epic proportions. One-And-Only! A Japanese Country Singer in the USA!! That’s right! It is another music invasion from foreign country. This time it wasn’t British. It was a little Japanese guy! The former guitarist of New York Shock Rock Band, The Voluptuous Horror of Karen Black, Samoa leads his anti-Neo-Right Wing country band called The Lonely Samoans. If you are right-winger, you’ll hate them. Why country music? -“It is a perfect vehicle to express the daily struggle and despair of poor American life like mine. Also country music could use a little yellow blood”, says Samoa. Samoa was born in a tiny fishing village in Hiroshima, Japan, with a wandering soul. While watching the landing of the moon on TV, his curiosity reached to the max. He promised himself to seek the opportunity one day in the land of free, America! But He was only to discover that rich gets richer and poor gets poorer,independent ideas and colorful cultures are replaced by corporate logos over the decades. “It was time to make the stand for myself”, Samoa states. He carefully assembled top-notch musicians to stand up and fight Back. 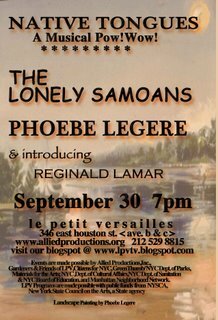 Today Lonely Samoans represent a new trend in modern country music; heavy handed political message delivered in a barely comprehensible accent, with bits of love and heartbreak, hilarious sense of humor added. But they look and feel great. – Stay tuned. 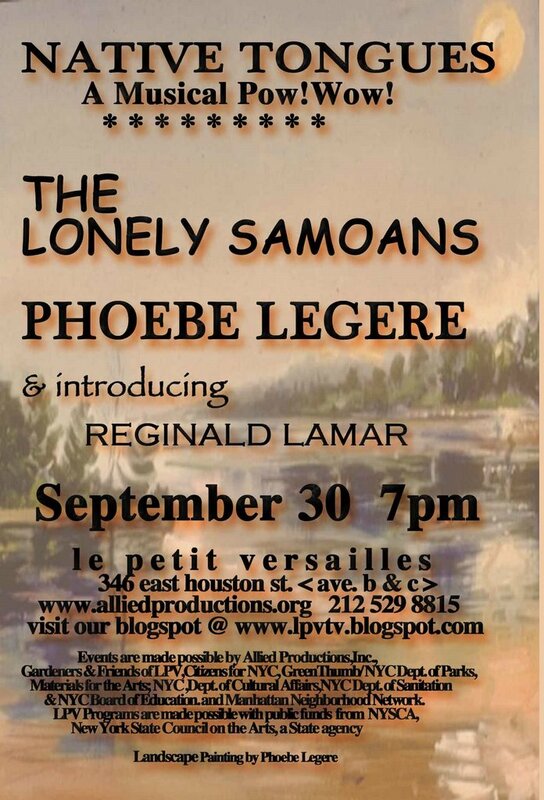 Phoebe Legere will perform with Scot Hornick, bass. He has his Masters in Jazz from NYU and is director of the bass ensemble there. “We use ancient Native American chants and Franco American reels and dances as departures for free folk improvisation. I will be playing the Sneakers of Samothrace too!” – PL. A dynamic performer on piano, accordion and synthesizer, with a four and half octave vocal range and free-for-all approach to mixing jazz, cabaret, and rock, Legere initially earned renown as a songwriter with hundreds of songs in all genres, and was signed to Epic/Sony Records. Demonstrating Legere’s mastery of diverse contemporary musical forms, in 1993 she had eight weeks of sold out shows at The Ballroom in New York, where she performed original songs and blues, French Chansons and Native American chants; and then, opened up for David Bowie on a national tour. She has performed at the Cinegrill in L.A., Michael’s Pub, Davenport’s in Chicago, the Chicago Cultural Center, Carnegie Hall, the China Club, Aspen Opera House, Freddy’s Supper Club, the Supper Club in New York City, The Hong Kong Jazz Club, Philadelphia Art Museum, the Brooklyn Academy of Music, the Brooklyn Opera House, Symphony Space and at the Nairobi Casino in Africa. She presented her Sneakers of Samothrace, a wearable computer for music and art improvisation, in a lecture/performance at IRCAM’s Resonances Aux Festival in Paris in 2004. and was an artist in residence at STEIM electronic music foundation in Amsterdam in May 2006. A work she made using the sneakers as an interactive paintbrush is on view now at the DIGITAL SALON 2006 at the School of Visual Arts. Legere has released seven CD’s of original music, and has appeared on National Public Radio, CBS Sunday Morning, PBS1s City Arts, and Charlie Rose. Legere is head writer and host for Roulette TV, a NYC show about experimental art and music. She records for Einstein Records, a label known for experimental and adventurous music. Legere has also been a Native American special educator in the New York City public schools for ten years. This week Legere’s Pulitzer nominated “Waterclown” her New Classical collaboration with composer Morgan Powell, will be released on TNC Records. Visit TNC.net for more information . Legere’s next CD due in March is an album of her own compositions, produced by Tony Bennett’s son Dae at the Bennett Studios. Legere is backed by Savoy Brown Blues Band on this roots alternative release. This summer she will be touring festivals all over the country playing her original, Acadian influenced music which was described by the Washington Post as, “ A highly intelligent stew of Musette, Cajun and Blues which she calls ROOTS ALTERNATIVE. Phoebe Legere is running for governor of New York State on the Integrity Party ticket. reginald lamar has recently relocated to new york from san francisco. Mr. lamar is a classically trained counter tenor/male soprano whose original songs fuse punk rock, gospel ,cabaret and blues. Mr. lamar’s music is concerned with the pornographic, the perverse and the provocative. “the songs” say lamar “are closer to french writers like de sade, genet, and Bataille in the way that they are pornographic but trying to comment on culture and society in some way.” many of the comments Mr. lamar is making are centered around black american issues that are, of course, american issues in general. band that lamar formed and fronted as the main songwriter.